Vice President Thinh made the remarks at the Opening Ceremony of the 2018 Global Summit of Women in Sydney, Australia, on April 26. She highly spoke of what the Global Summit of Women has done over the last three decades to promote the role of women in all spheres of life, particularly in economy, and to strengthen connectivity between women business leaders around the world. Thinh reiterated the importance of strengthening regional and global connectivity, saying it is an irreversible trend which has brought enormous opportunities to countries and businesses to fully tap their potential in the global value chain. She also mentioned Vietnam’s contributions to creating shared values of the global economy, particularly through its initiatives within the framework of the APEC Year 2017. Women have played a key role in promoting global governance, inclusive and sustainable development and creating economies of shared values, the Vietnamese leader said. 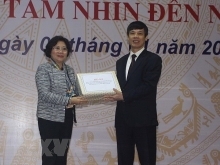 She highlighted Vietnamese women’s contributions to the national economy as they make up 48 percent of the workforce and about 25 percent of CEOs or members of boards of directors in the country. 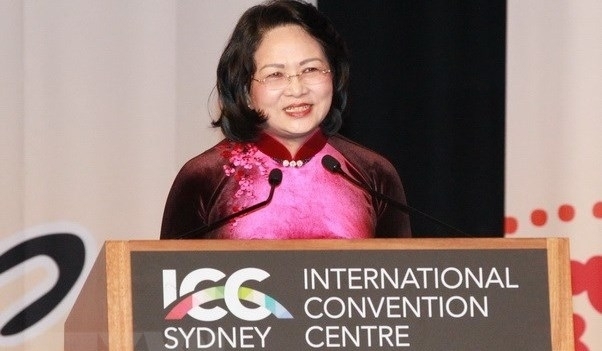 Joining in regional and global connectivity has given Vietnamese women better access to sustainable development models as well as the world’s latest technologies and knowledge, Thinh noted. On the other hand, Vietnamese women are facing many difficulties, including access to loans and new skills to keep up with the rapid transformation of the global economy, she added. Vice President Thinh went on to emphasis that promoting gender equality and empowering women should always be a key pillar of the national policies and women should be provided with better conditions to get access to resources, to expand production and to do business. The 2018 Global Summit of Women is taking place from April 26-28 under the theme “Women: Creating Economies of Shared Value”. The event has gathered more than 1,200 delegates from over 65 countries and territories, including government leaders, CEOs and executive leaders, business leaders and entrepreneurs from all parts of the world. The Vietnamese delegation also had a roundtable with Australia on gender equality, in which the two sides shared experiences in promoting gender equality and empowering women and girls and discussed ways to encourage the women’s leadership in business. The Global Summit of Women has been held annually for over 27 years. It aims to expanding women’s economic opportunities globally through exchanges of working solutions and creative strategies forged by women leaders in different parts of the world. It is a business summit, whose ‘business’ focus is women’s advancement in the global economy.